Warning! Your account has been violated! 3. URL of spoof website disguised as "Click here to activate your account". 4. Real URL looks nothing like PayPal. 5. URL of spoof website appears to be invalid. 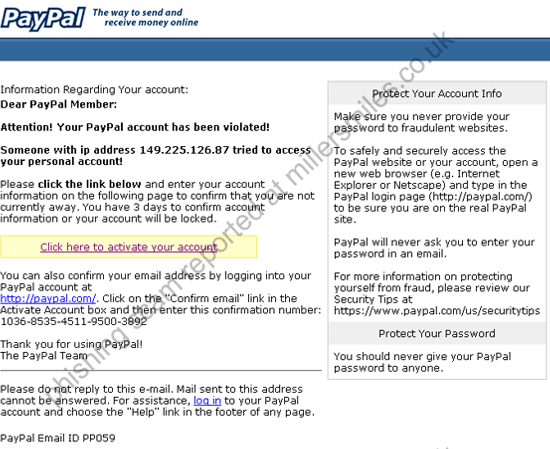 However other 'working versions' of this scam are likely to be in circulation - be alert!
" Please click the link below and enter your account information on the following page to confirm that you are not currently away. " URL of spoof website appears to be invalid. However other 'working versions' of this scam are likely to be in circulation - be alert!